I have talked a little bit about death and resurrection in the past. 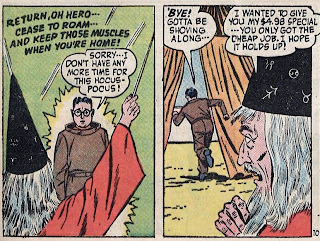 Lightning Lad was one of the first major instances of it involving a hero in the DC universe, at least where the resurrection was not immediate. 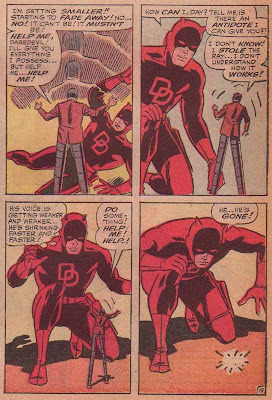 But in the Silver Age, Marvel seemed to be the place where corpses got up and walked on a regular basis (especially villains), and so I thought I would try to catalog all of their examples. Of course, an undertaking like this is going to require the assistance of my readers. Although I have read virtually all of the Silver Age Marvel line, my memory's nowhere near as good as it used to be. 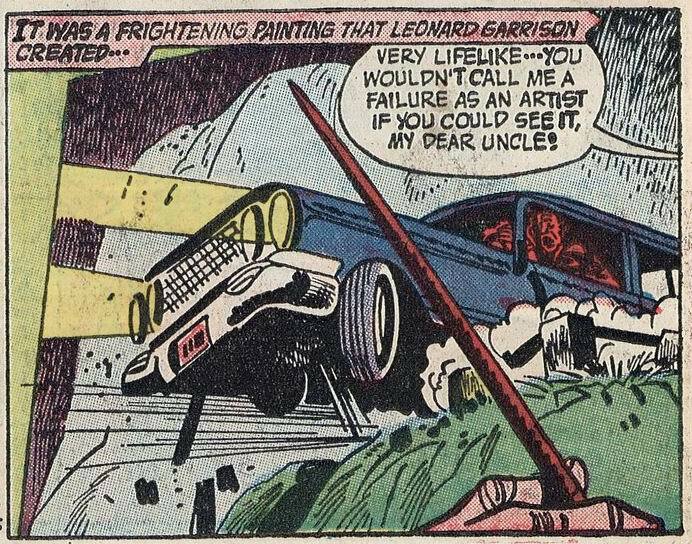 He returned in FF #14 and, although he apparently bit the bullet at the end of that issue, many more times as well. 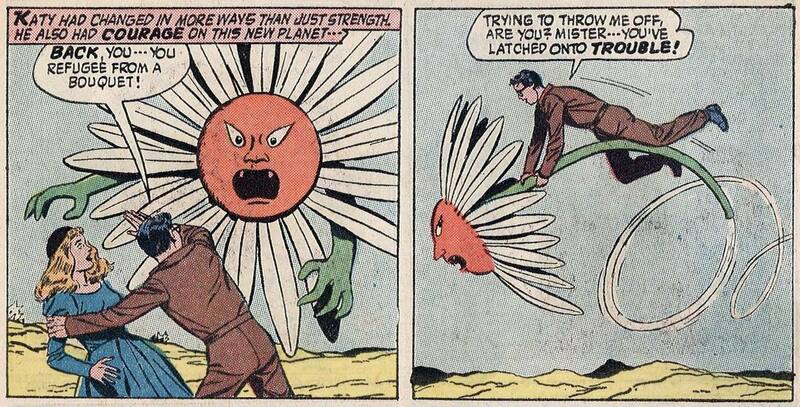 One of the interesting things about that initial resurrection, though, was that Stan didn't bother to explain it. Never mind that (as shown above), we'd seen him fall out of a skyscraper. This would become the rule, rather than the exception. The original Vulture apparently shuffles off the mortal coil shortly after that scene, although he returns in ASM #63 to battle both Spidey and Blackie Drago, his chosen successor. 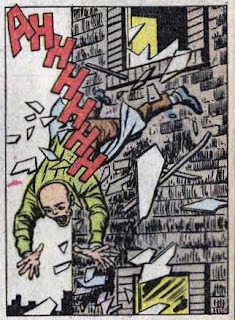 I'm again not aware of any other deaths and resurrections in the Silver Age involving Spiderman, although there are some (Silvermane, for example) who died in the SA but didn't respawn until much later. And both the Leader and the Rhino appear to die at the end of Hulk #124, but we know better. The Black Widow had a couple of brushes with the Grim Reaper, as I have covered in the past. 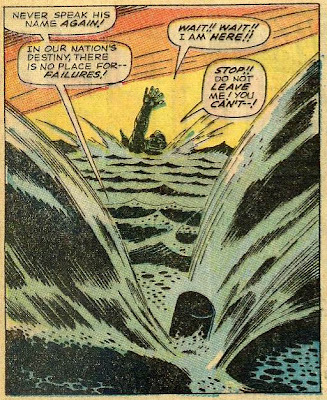 And I know the Unicorn appeared to die in Iron Man #4. Any more examples? 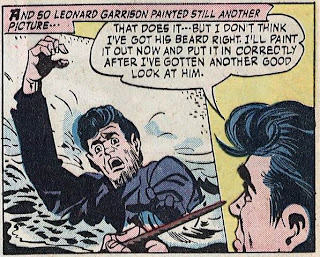 I'm mostly interested in cases where the resurrection happened by the end of the Silver Age, simply because there are so many examples after that. 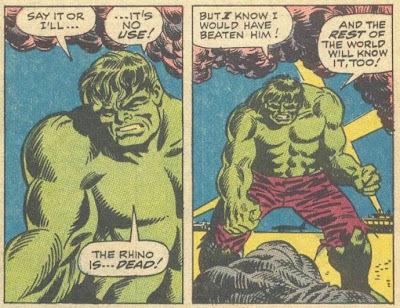 And, as my anonymous commenter noted, he returned in the Hulk #107 with no particular explanation. MDTD, I suppose? 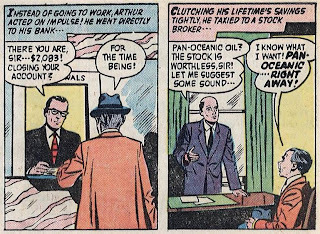 When the Leap-Frog asked him about his apparent death, Stilty was rather terse, replying, "You seem to have an uncanny knack for being wrong." Another commenter pointed out that Magneto died in X-Men #53 and returned in X-Men #62; I can't find those issues at the moment to post panels. 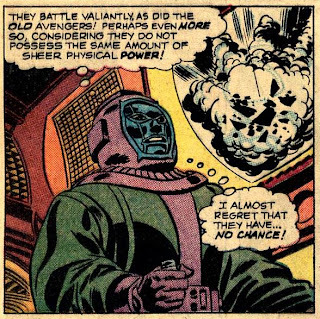 Observations: One thing seems apparent; the villains who "die" on multiple occasions but return just as often tend to be Marvel's top antagonists; Dr Doom, the Mandarin, the Red Skull and the Leader are all on the short list of major baddies. 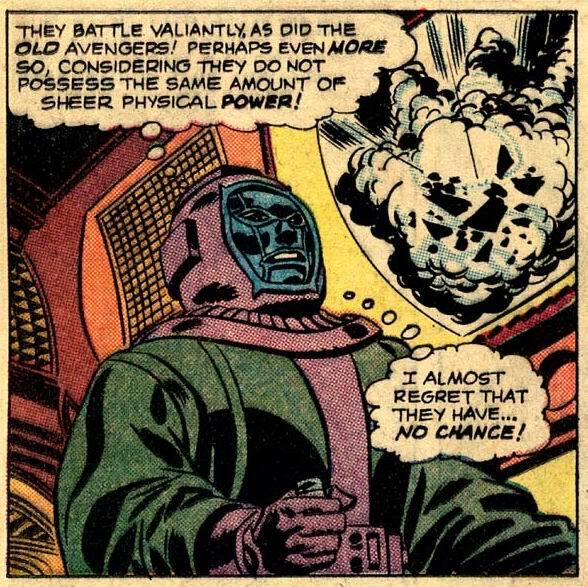 He returned in Avengers #41, with the explanation that he owed his survival to alchemy. Which turned out to mostly involve attacking Tony Stark's industrial plants. And over the next year or two, Hawkeye frequently bickered with Captain America, questioning both his decisions and his right to command the group. Indeed, it often seemed as though the only reason Steve Rogers kept his position was because Quicksilver also wanted to lead and the Scarlet Witch, with the deciding vote, formed a crush on Cap. 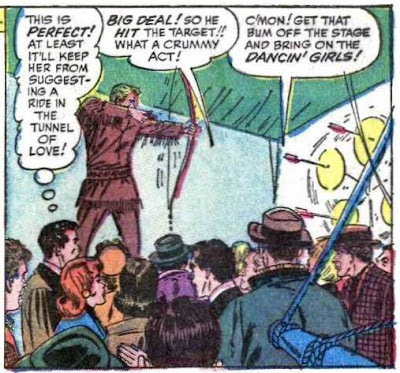 Oh, and no particular surprise, Hawkeye didn't have the noblest of reasons for wanting to run the show; he sometimes admitted to himself that he just wanted the glory of being known as the leader of the Avengers. 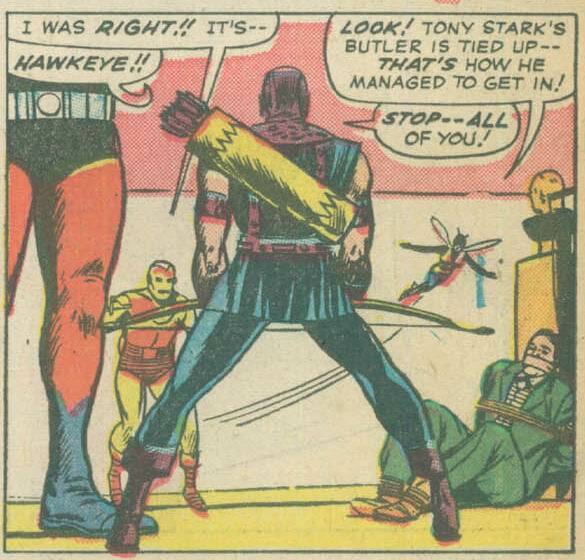 There was another aspect of the quarrel between Hawkeye and Cap that was interesting. 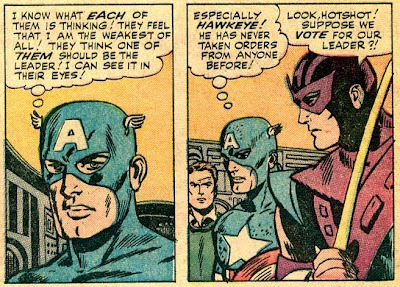 Despite appearing physically the same age, Cap was from a different generation. Hawkeye was brash and arrogant, while Rogers was cautious and a bit stodgy. At first, I confess that I found their verbal jousting a bit tedious. Stan Lee's arguing characters tended never to resolve their differences. JJJ always hated Spiderman and the feeling was mutual. 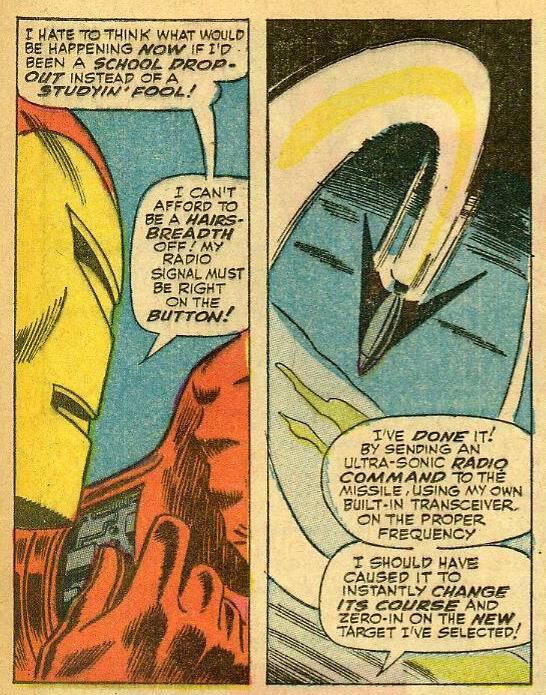 The Thing constantly bickered with Johnny and Reed. That's characterization done right, because it's positive for both characters. 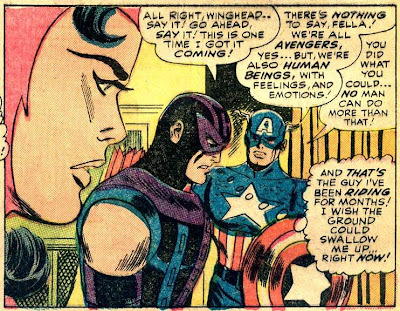 We see Cap's understanding and Hawkeye's guilt at having treated him badly. 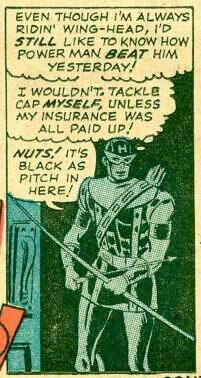 In the next issue, Cap agrees when Hawkeye asks to tackle the Widow and her henchmen alone. And while Hawkeye did not give up the occasional jibes about Captain America being Methuselah, you definitely began to get the feeling that it was pro-forma; that there was no real antipathy between the pair. It was a nice moment of growth and change. Although it became known in the 1960s as a tryout magazine, and later as a team-up comic, the Brave and the Bold started out as a swashbuckler. You may recall that a similar origin was proposed for Conan's muscles in the first Arnold Schwarzenegger movie. 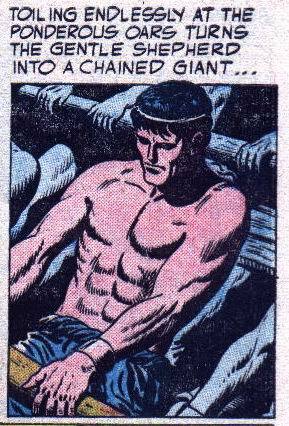 A lion gets loose in the galley and Marcus manages to break his chains and kill the beast with them. 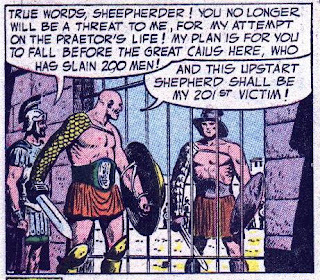 The slave-master realizes his young oarsman will fetch a good price as a gladiator. Unfortunately for our hero, he is sold to Cinna, the Roman who accused him of attempted murder. And Marcus rides on to victory, although Cinna still plans to find a way to kill him in the future. 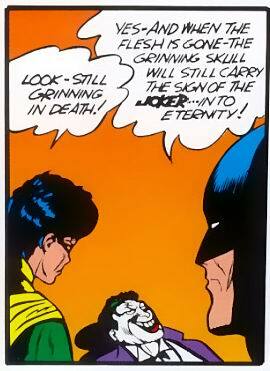 Comments: Entertaining origin story and terrific art by Heath. 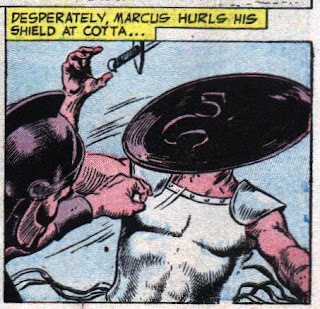 Check out the design on Cinna's breastplate in that next to last panel above; just marvelous details. 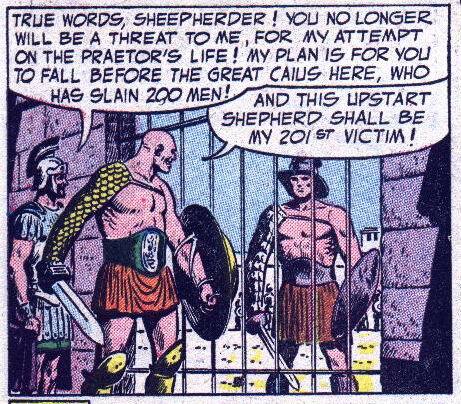 The plot bears quite a resemblance to the novel Ben-Hur, but unfortunately for the feature the famed movie featuring Charlton Heston was still a few years in the future. Trivia bit: Did you know that Ben-Hur was for many years the best-selling American novel of all time, until the publication of Gone With the Wind? 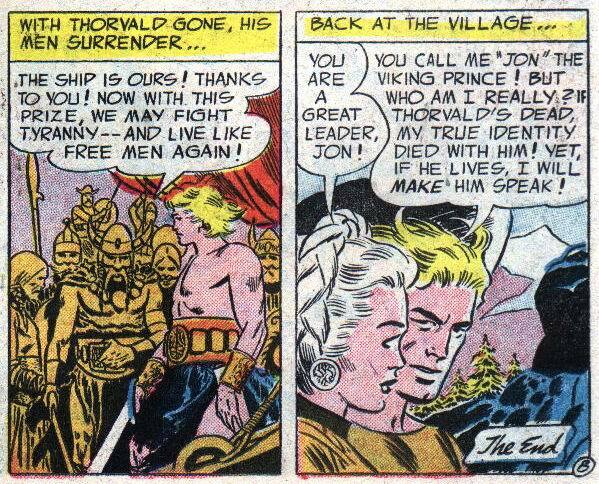 The issue continues with the Viking Prince. The story begins with a fishing skiff picking up a young warrior, nearly drowned in the sea. 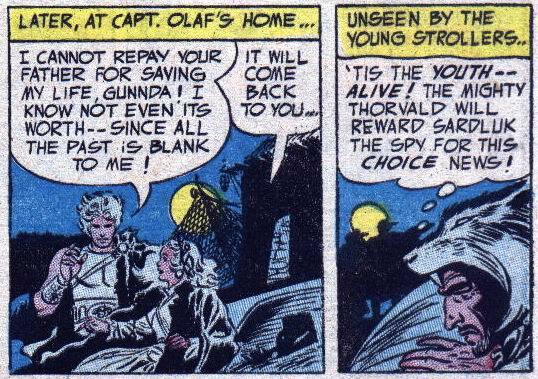 He has amnesia, but we quickly learn that he was the subject of an attempted assassination by a Viking lord named Thorvald. 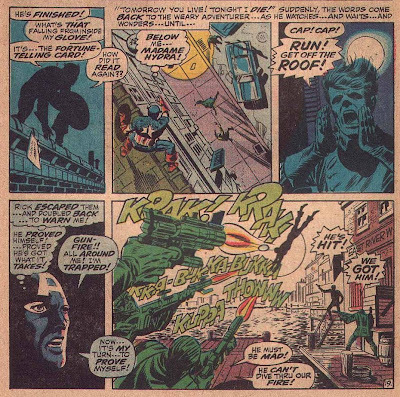 Comments: Another fine story by Bob Kanigher and adept art by Kubert. 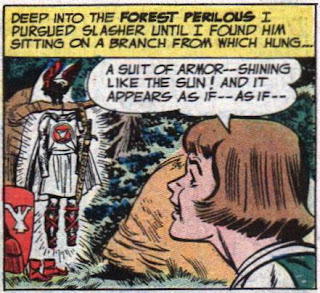 After trying on the armor, he overhears some of Sir Oswald's men waylaying some travelers (including the requisite fair maiden). 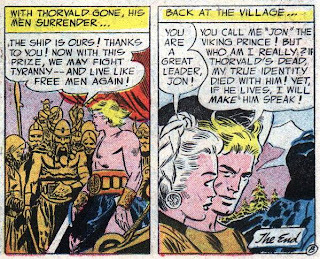 He springs to their rescue, but when the men demand his name, he realizes he cannot speak without revealing his true identity. Thus they dub him the Silent Knight. With the help of Slasher, he defeats the brigands and leaves the armor back in the hidden glade. 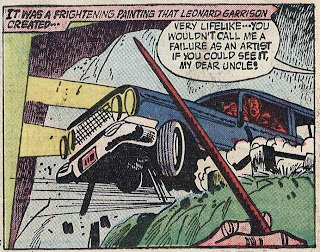 Comments: Kanigher and Irv Novick team up on this solid origin tale. 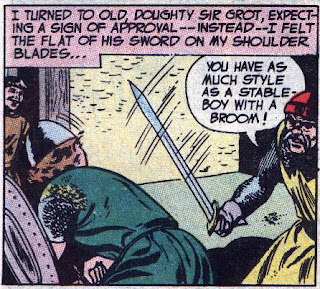 Overall the issue was quite entertaining and it must have been at least moderately successful, as the swordfighting continued for the next four years. 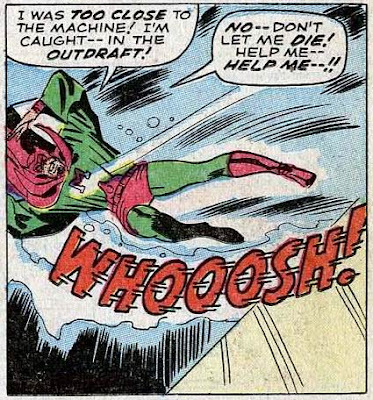 Mort Weisinger and his writers had continual problems with the Legion of Super-Heroes. 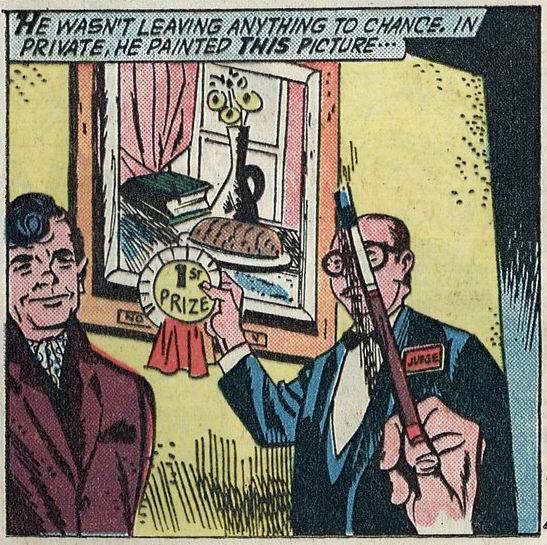 In a way, this is not terribly surprising. 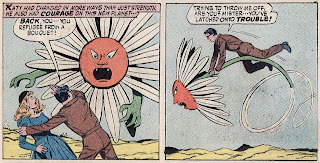 The Legion was initially intended for just one story, the original tale in Adventure #247. 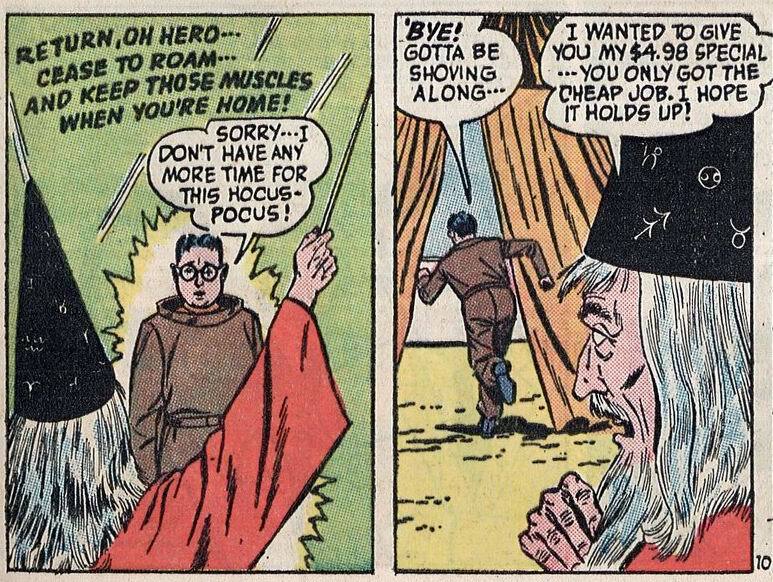 But a few issues later, Mort began putting letters pages in Adventure, and while I haven't been able to locate any letters that were actually published, it seems logical to assume that at least some fans wrote in requesting a return of the superhero team. And so, over time, they became a regular part of the Superman family, eventually supplanting Superboy himself as the cover feature in Adventure. But in some stories, the Legion was set only 100 years in the future. This seems like a minor problem, except for one thing. As I have discussed in the past, when DC reprinted that story years later, they edited the text, so that Supergirl was joining the same Legion. 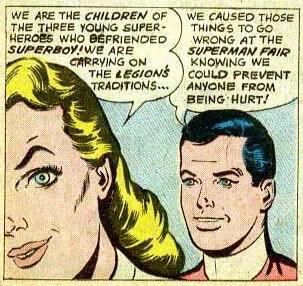 In the interim between the two appearances, Weisinger had come up with a solution to the dilemma of having Superboy know of the existence of a Supergirl in the future. 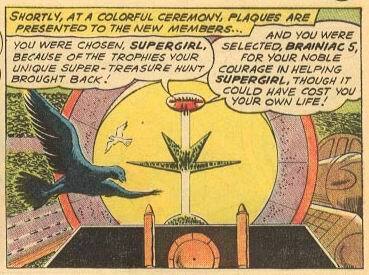 Supergirl had hypnotized him into forgetting her except when he was in the future. 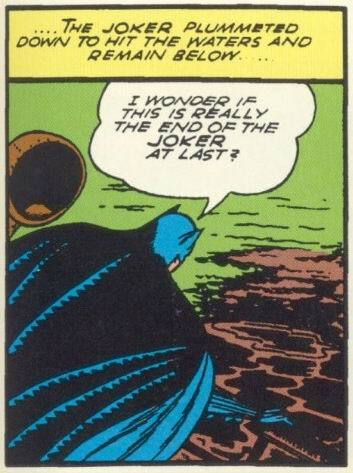 But there was another problem that popped up that never was resolved in the Silver Age. 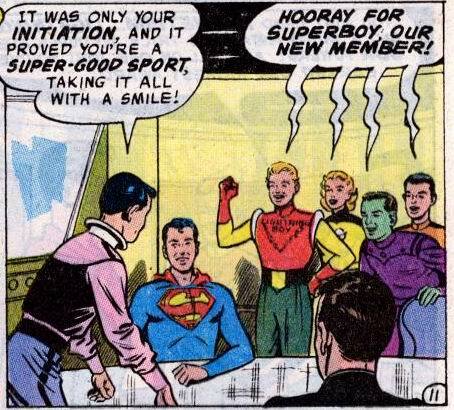 Supergirl actually was rejected for membership in the Legion in that first story, although there was a reason. She had been exposed to Red Kryptonite, which turned her temporarily into an adult. 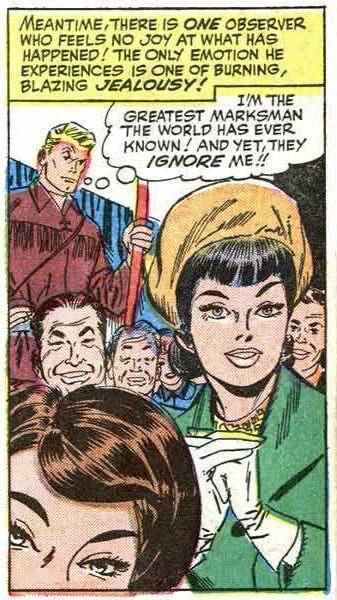 Since the Legion was for teenagers only, she was unable to join that time. 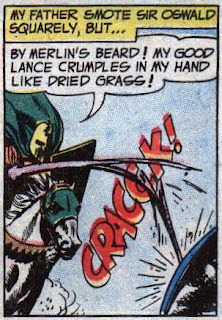 Note that the coloring in that panel is in error; for most of the story, Brainiac 5 has a green face, like his ancestor (and like his hands). Also note that the numbering appears wrong; Brainiac's son would be Brainiac 2, his grandson Brainiac 3, his great-grandson Brainiac 4 and his great-great-grandson would be Brainiac 5. So his great-great-great-great-grandson should be Brainiac 7. 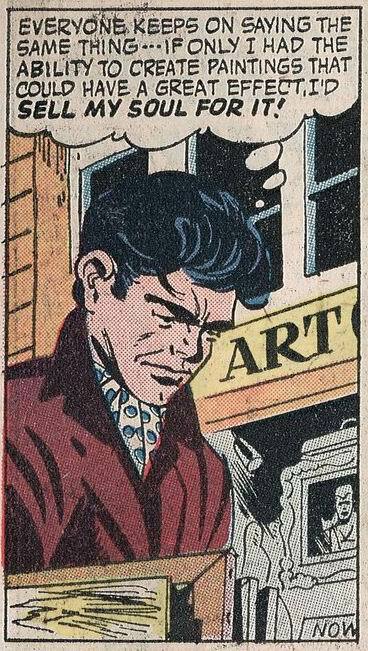 Of course, the possibility exists that only male descendants of Brainiac inherited the name. But the problems don't end there. Remember, this story is supposedly taking place 1000 years in the future. 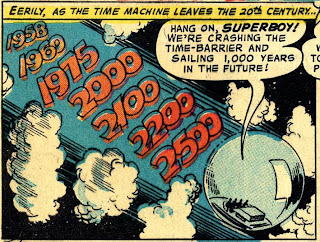 Unless the Brainiac clan has an extraordinary lifespan, wouldn't his great-great-great-great-grandson be living more like 150 years in the future, rather than 1000? 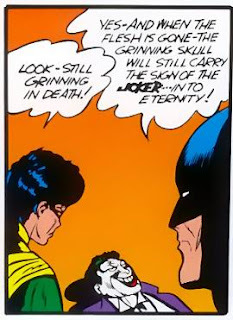 A likely explanation is that the writer thought the Legion was only 100 years in the future. 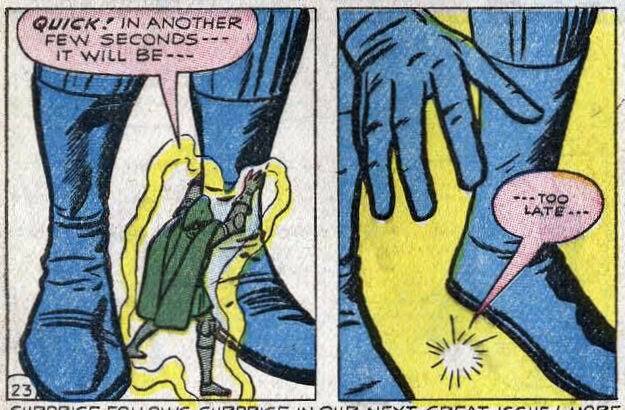 A generation is usually considered to be 20 years, Brainiac 5 (ignoring the great-great-great-great grandson mistake) would be around 100 years after his ancestor. Except that doesn't really explain anything. 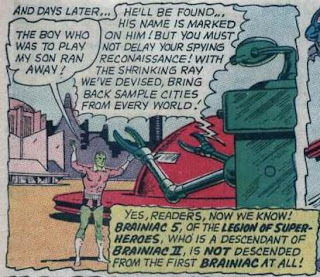 For starters, if Brainiac II escaped and despised the original Brainiac, why would his descendants continue to be named after the computer? 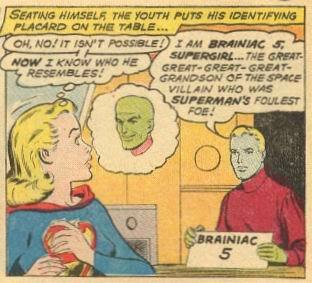 So maybe they did find him and brainwash him into thinking that Brainiac was indeed his father. But there's still a problem. Remember, Brainiac 5 supposedly had a super-genius mind; that was his super-power that got him into the Legion. But Brainiac II was just an ordinary boy (from a planet where the inhabitants had green skin). How did his descendants get so smart? 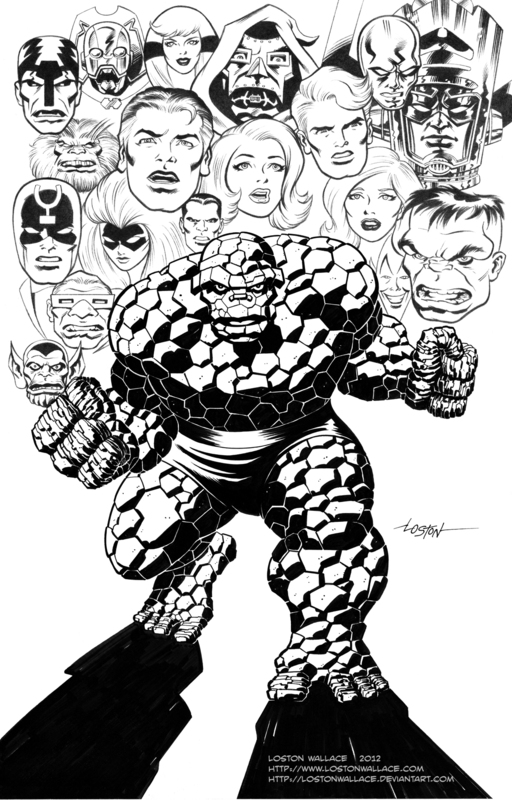 Loston Wallace created a terrific picture of the Thing, featuring the other members of the FF and some of their more memorable antagonists. I wish I had that kind of talent; even my stick figures look bad. 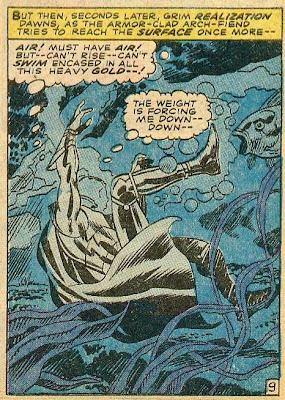 For nearly forty years, despite all the times Marvel had tantalised Captain America and the readers with “Bucky Returns!” plotlines, the true Bucky Barnes had remained really, most sincerely dead. So certain was this that the comics fanship coined the term Bucky-dead for any character perceived to have been killed off permanently, with no chance of revival. 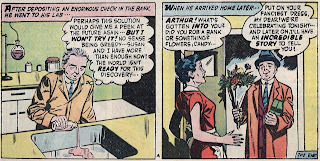 Blog Into Mystery blogs the wedding of Barry and Iris back in 1966, and points out a very interesting and early Easter Egg on the cover of that issue that I'm ashamed to admit I missed entirely up until now. 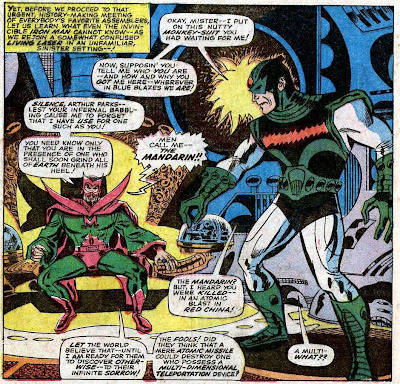 Booksteve covers the Marvel Universe 50 years ago this month. 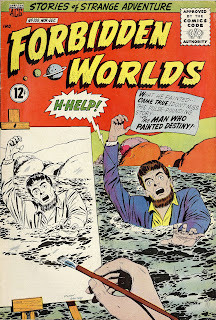 Of course, back then there were only two comics that really qualify as Marvels, and one of them comes with an asterisk. A 324-page comic book for Christmas? 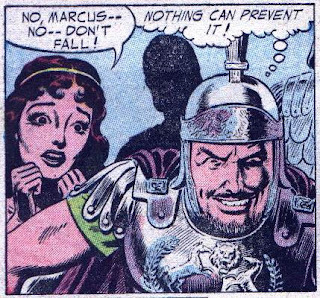 And no, it's not one of the Cerebus phonebooks, it's a Golden Age comic featuring Captain Marvel and other Fawcett superheroes. For previous installments in the When I'm the Evil Genius series, click here. Okay, so Celia isn't really his type. Bat decides to pull a prank on him. He gets several buddies to dress up as generals. 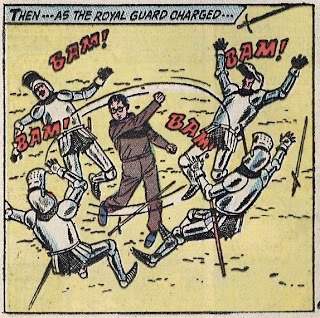 They tell Caton that the astronaut scheduled for the next mission has taken ill, and that they have decided that he must take the rocket jockey's place. They strap him in and put a firecracker under his seat, knowing this will scare him thoroughly. 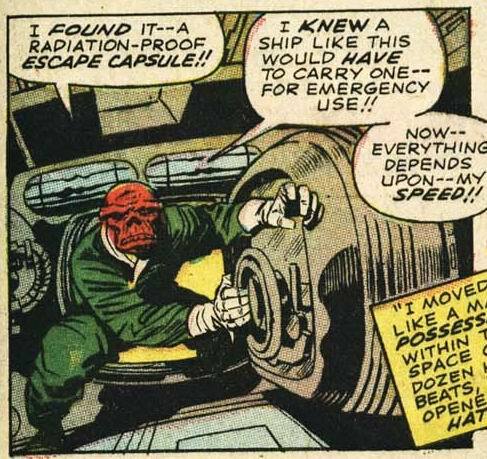 It succeeds, so well that Caton is blown out of his seat and lands on the rocket's firing mechanism. 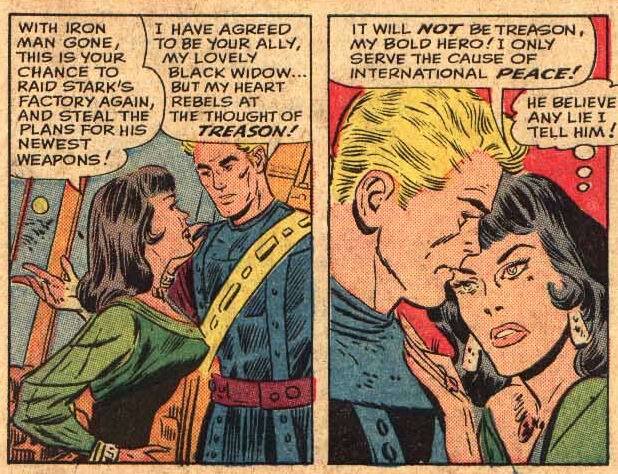 And with a princess won, he has no interest in Celia Jones when she flirts with him. He even wins first prize in the company costume ball, dressing up as (what else?) a knight in shining armor. Comments: Cute story. 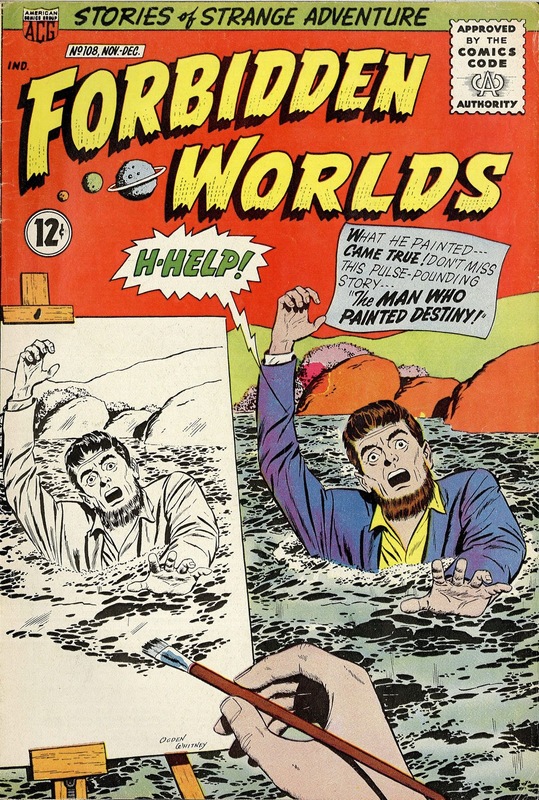 Writer Richard Hughes did a lot of these types of tales, where the hero takes a trip (often to another planet) and comes back with new confidence and drive. It's not hard to see the appeal to adolescent boys, who were often subjected to bullying and the scorn of the girls they adored. Comments: A beautiful little story. Hughes often used a similar plot of someone gaining unexpected riches and then blowing it. 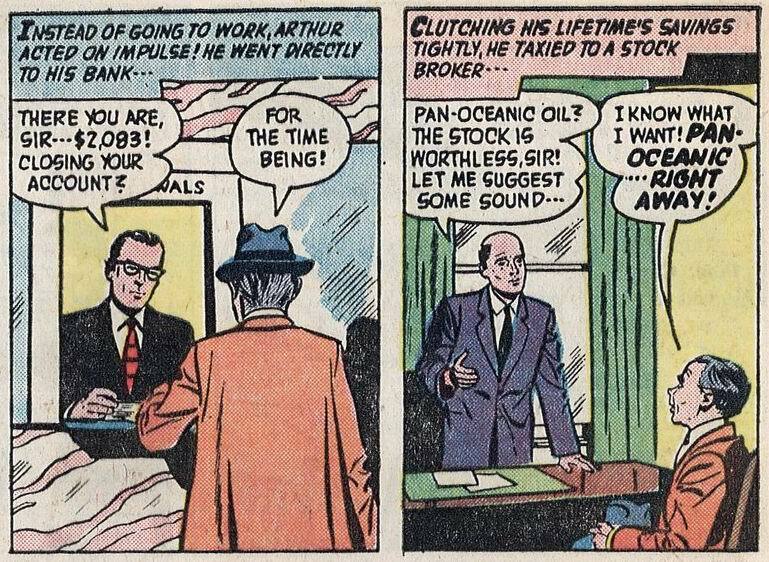 Arthur shows that he deserved his little stroke of good fortune, and has more sense than to try to parlay it into a bigger payday. 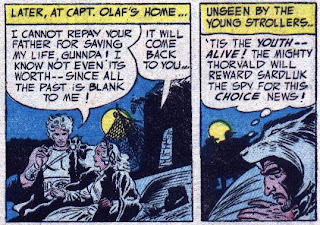 The third story is a very shot tale of a sailor who receives a visit from his wife in a dream. She's concerned about reports of severe weather on the seas. The next morning, his bunkmate reports that he also saw the woman. 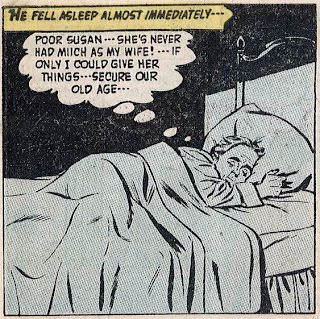 And when he returns home, his wife had had the same dream of visiting him. What happened? Comments: These stories are not Hughes' forte, because there isn't room for any real characterization. 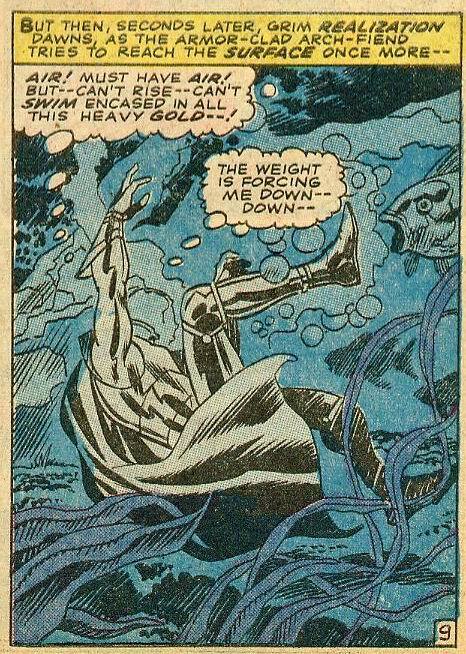 falls into an old well the next morning and drowns, much to the delight of Mephisto, who comes to collect his soul. Comments: Somewhat predictable, but still very entertaining. 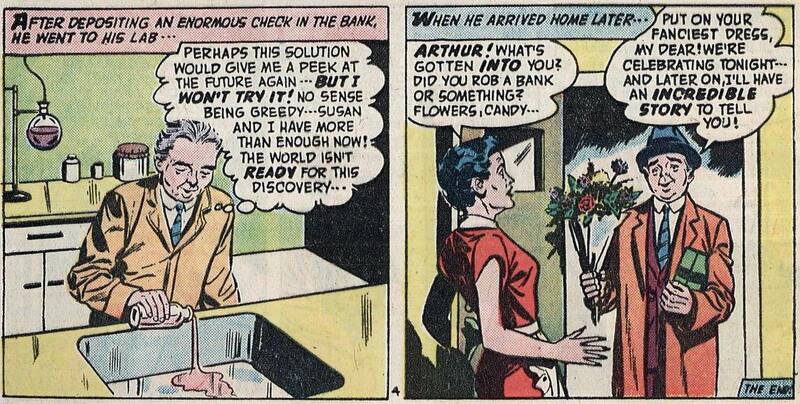 It's the flip side of the Arthur tale. Overall, as usual with ACG comics, I loved this issue.